If you haven’t tried za’atar yet, well, then what za’atar you even doing? 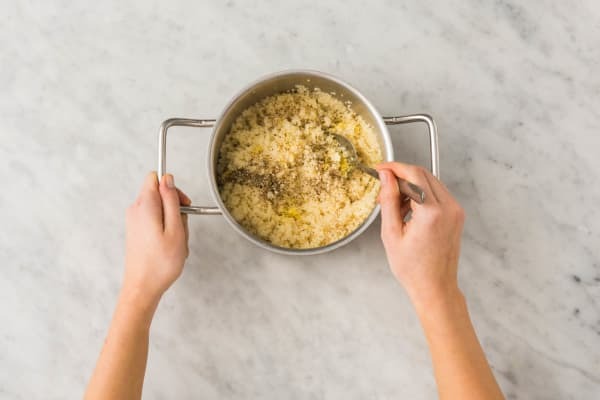 The Middle Eastern herb and spice blend livens up pretty much anything you sprinkle it on—here, that’s couscous, which goes from plain to perfect with its help. 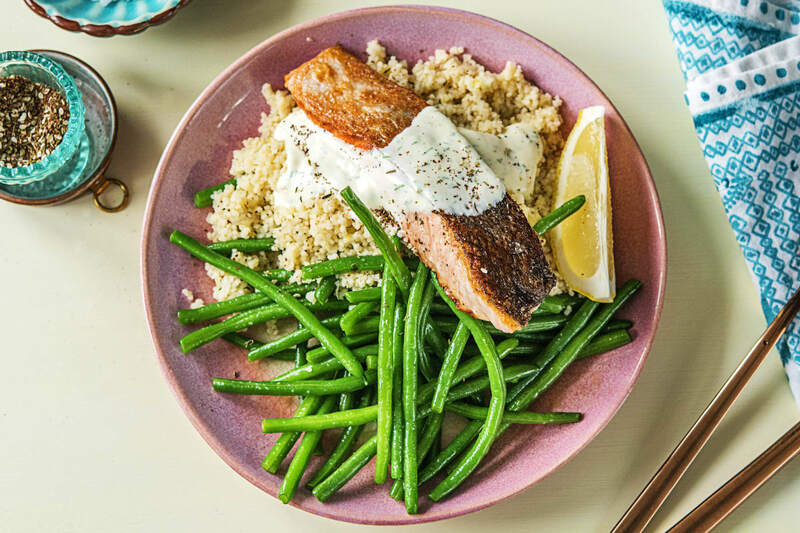 Not that this dish is otherwise lacking in flavor: between the tender, juicy salmon; buttered green beans; and creamy dill sauce, there’s plenty of impressive elements to choose from. Wash and dry all produce. Bring 1 cup water and 1 TBSP butter to a boil in a small pot. Pick fronds from dill. 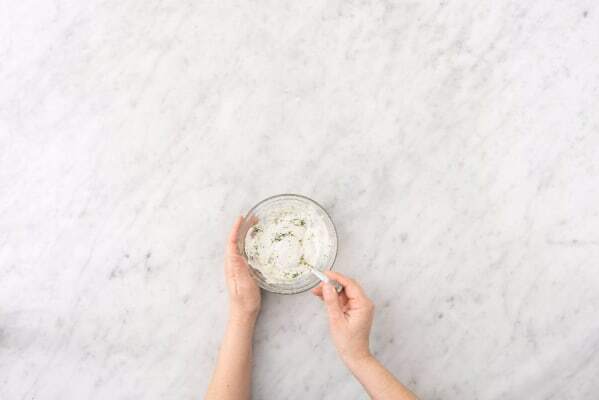 Finely chop a few fronds until you have 1 TBSP chopped dill; save remainder for garnish. Zest lemon until you have 1 tsp zest, then cut into wedges. Season salmon with salt and pepper. Once water is boiling, add couscous and a large pinch of salt to pot. Cover and set aside off heat. Heat a large drizzle of oil in a large nonstick pan over medium-high heat. 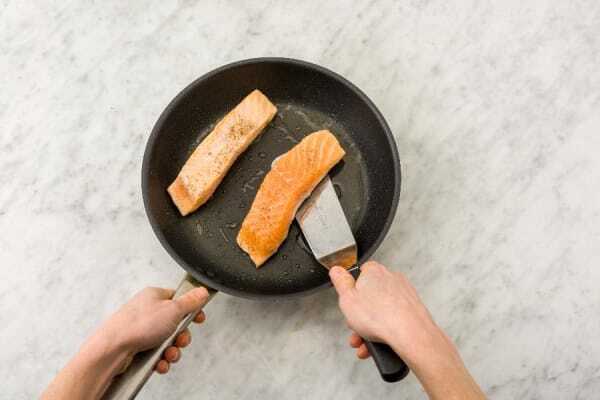 Add salmon to pan skinside down. Cook until skin is crisp, 5-6 minutes. Flip and cook on other side to desired doneness, 2-4 minutes more. 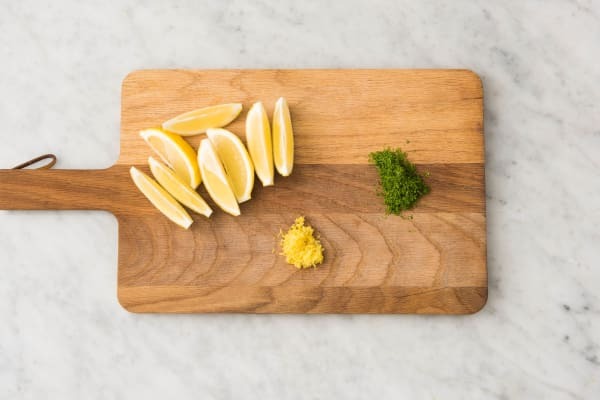 While salmon cooks, combine sour cream, chopped dill, half the lemon zest, and a squeeze or two of lemon juice in a small bowl. Season with salt and pepper. Pierce green bean bag with a fork and place on a microwave-safe plate. 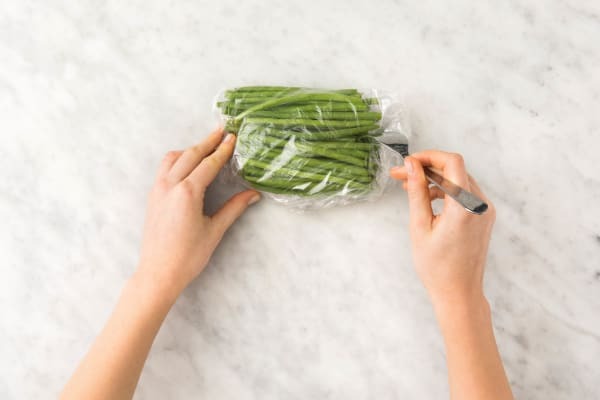 Microwave on high for 3-4 minutes (or until green beans are tender), then carefully remove green beans from bag and transfer to a medium bowl along with 1 TBSP butter. Toss to melt butter. Season with salt and pepper. Fluff couscous with a fork, then season with salt and pepper. Stir in remaining lemon zest and half the za’atar. 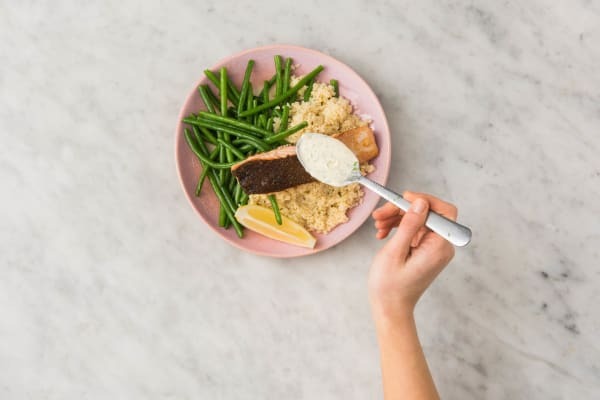 Divide couscous and green beans between plates, then arrange salmon on top of couscous. Drizzle sauce over salmon, then sprinkle with remaining za’atar and dill (to taste). Serve with lemon wedges on the side for squeezing over.